Distilling the essence of an entire Arts community and brewing an exhibition that seeks to intrigue, invigorate, and involve, is the goal of arts promoter Terry Rooney as she mounts her second Amherst Biennial. “Art in Expected and Unexpected Places” sets over 100 art pieces in three academic museums, an ATM bank lobby, a stationary storefront window, two frame shops, very deep along the Hitchcock Nature Trail, two libraries, the local Historical Society, a children’s museum, a clothing store, an assortment of greens and public spaces sometimes miles apart, and a pop-up gallery that also serves as the Biennial’s welcome center. This ambitious undertaking opened on Oct. 6th and continues through November 30. 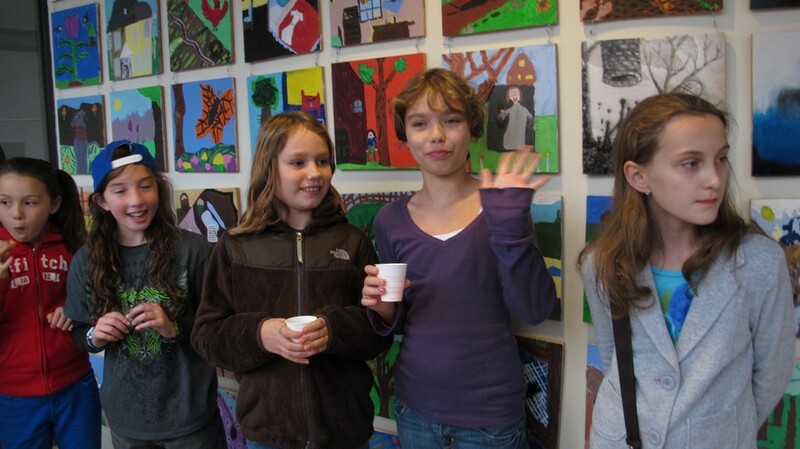 Forty-six artists participated in the project including two octogenarians and an amazing teenager from Deerfield Academy. 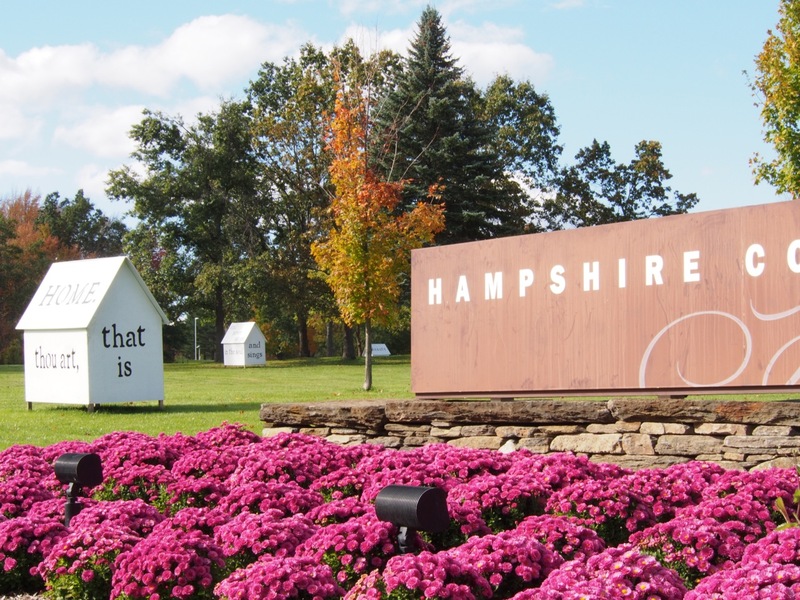 As one drives in and out of Hampshire College the collective formation of the houses and their emblazoned thoughts present a different perspective, a poetry of landscape that is a joy to behold. Amazingly, the young man’s project has included a total of 38 houses in its peripatetic history. Adjoining the Little White Houses at the Hampshire College site is a monumental tower of heavy bent steel lyrically rising from its base in a facile defiance of gravity. 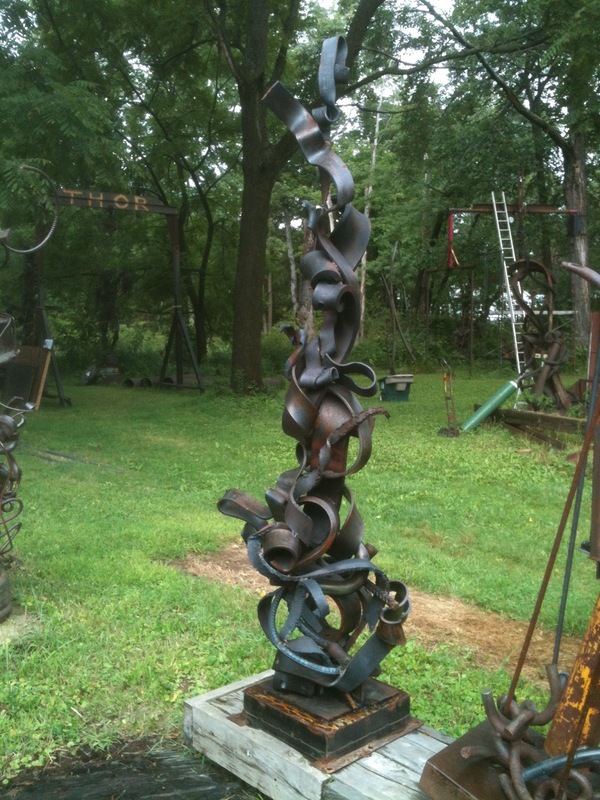 The convoluted mass of interlocking tendrils is the work of Matt Ewald Johnson. Johnson’s massive oculus from the first Amherst Biennial still stands in its place in Kendrick Park. 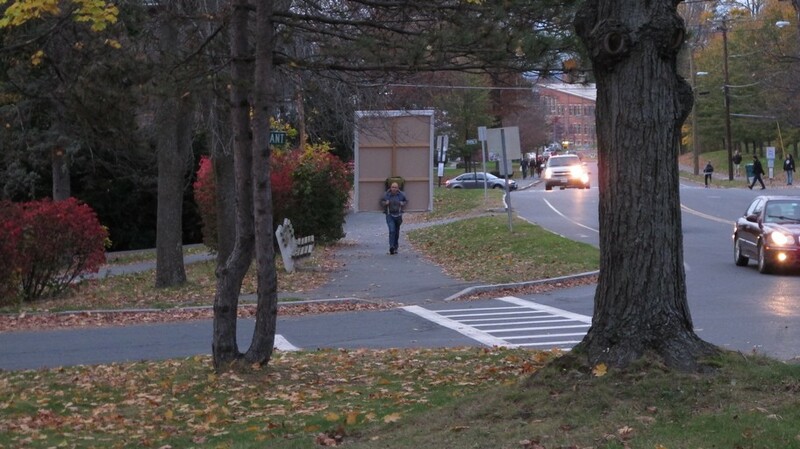 It is in the process of becoming a part of Amherst’s permanent public art collection. A newcomer to the Amherst area, Dawn Howkinson Siebel, is represented at three different Biennial sites. The Frost Library at Amherst College showcases a triptych of her 343 firefighter portraits executed on burnt wood, an homage to the 9/11 tower disaster. However, most striking are her two biblio-sculptures cleverly placed in the center of the Jones Library’s Atrium. The pressed open pages of two ancient encyclopedias are the springboard for Siebel’s collaged fantasias. Visitors searching for their book of choice are destined for an encounter with Siebel’s provocative mixed media constructs. The impact of these two pieces of public art aptly demonstrate how important the proper placement and location of public art is to its overall success. 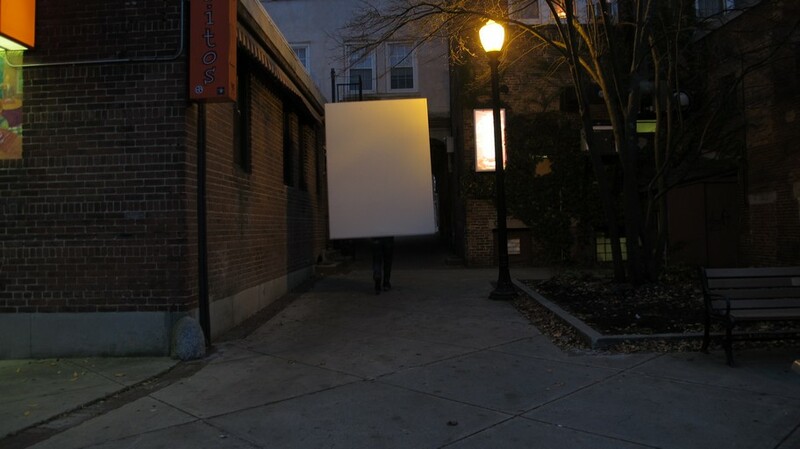 In addition to the drawings, paintings, and three dimensional works that comprise the 2012 Biennial, the performance art of Karen Dolmanisth is being staged in a series of incarnations at the Amherst College Mead Museum. THE BALANCE: NATURE/SPIRIT/BODY/BREATH IMMANENCE, is a site-specific work featuring dance and music presented outdoors in the Museum’s sculpture court, or in case of uncooperative weather, indoors. 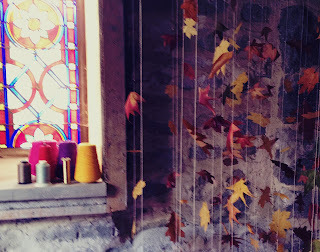 I was in attendance at the first of these week-end performances where the threat of rain moved the project to the quiet of the Renaissance Room of the Mead. Set on the floor of the Renaissance Room’s ancient floorboards was a geometric arrangement of muslim floorcloths, large swaths of drawing paper, and a collection of sealed objects of unknown origin. Dolmanisth is always compelling, unpredictable, and treading a challenging artistic path that takes her and her audiences to undiscovered country. For information in regard to the upcoming performances of Dolmanisth and complete information on all facets of the Amherst Biennial 2012 contact Terry Rooney at the Pop Up gallery at 59 Boltwood Court in downtown Amherst or by visitingwww.amherstbiennial.com. Karen Dolmanisth will be tying up her residency at tthe Mead Art Museum at Amherst College with a performance of IN BALANCE this Friday at noon with guest performers dancer Barbara Cortez – Greig and sitar musician, Sandy Cortez-Greig. 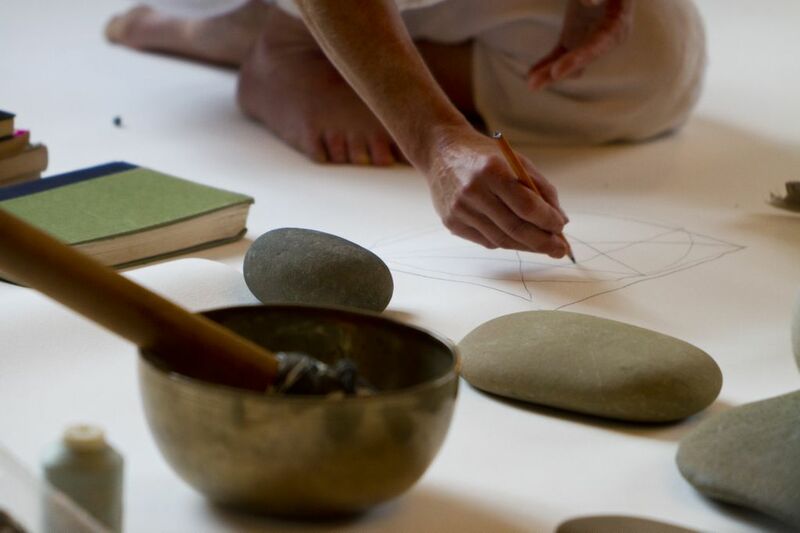 This will be a Celebration of Nature, Spirit, Soul, through Art, Music, Dance.Her performance will included sacred texts honoring the goodness of the earth and within us all. This performance is free and open to the general public. Andrea Dezso's Cut-Out Illustrations Book - Publisher's Weekly Best Book of 2012! 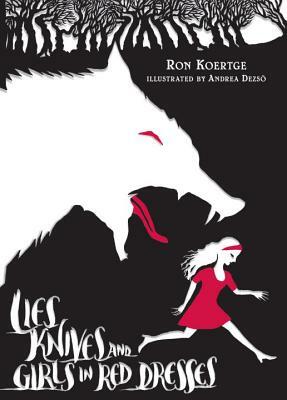 Andrea Dezso, one of the Biennial artists (her artist's book is on display at Hope & Feather's Gallery) has received accolades for her cut-out illustrations in Lies, Knives, Girl's Red Dresses. Publishers Weekly named it one of the best books of 2012. She will be signing copies of this book on Dec. 7th at the Odyssey Book store. Andrea Dezso is a mulit-media artist who designed two subway stations in New York City as well as a beautiful mosaic installation at the embassy in Budapest this year. The Fish Sufficeth is a sneak preview of Tim deChristopher's sculpture for a future installation at the DeCordova Museum. 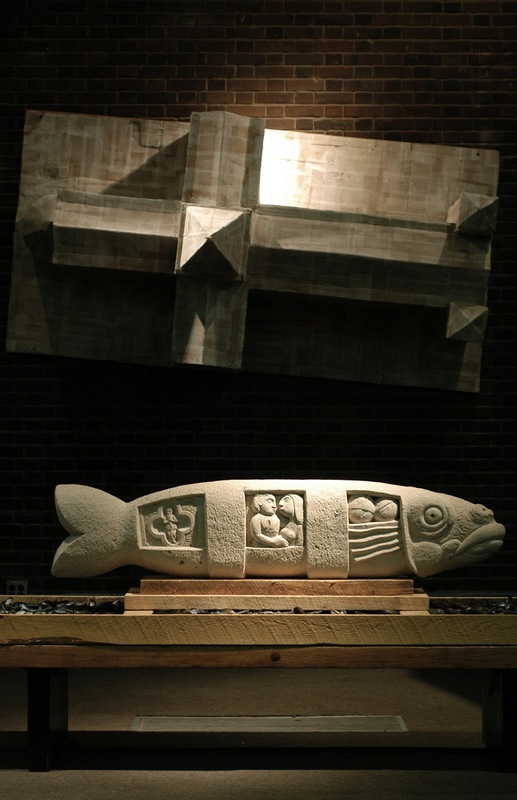 deChristopher comes from a lineage of stone covers, in fact he's the third generation to carve stone sculptures at St. John of Divine on the Upper Westside in Manhattan. 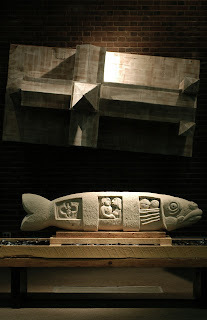 His installation outside Hampden Gallery at UMASS cleverly incorporates one of his fish (on a bench) with other nautical items with a model for his dream - the Cathedral Project which he hoped to create at Turners Falls. Unfortunately because of the financial collapse this project has not come fruition. Possibly as Tim's reputation grows maybe this project could become a reality. 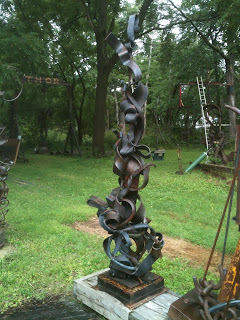 Tim's work is now represented by William Bascek Gallery in Northampton. Hopefully his work will start to get the attention it deserves. William Brayton's multi-media sculpture graces the front lawn of the newly renovated Lord Jeffrey Inn in downtown Amherst for the second edition of the Amherst Biennial. 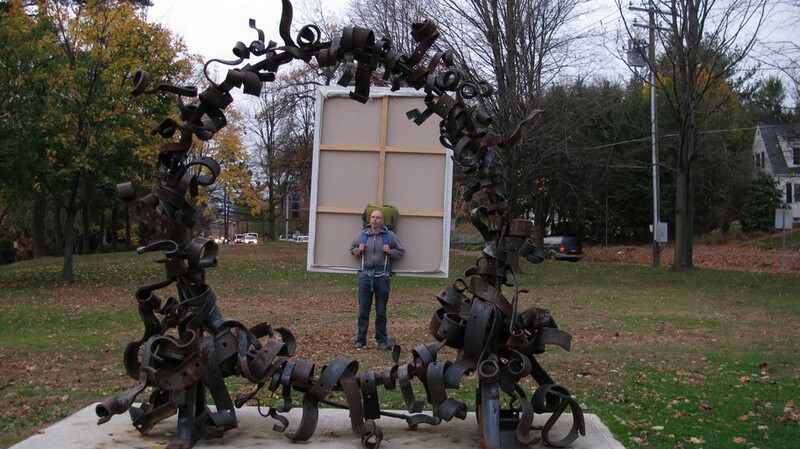 Brayton, an art professor at Hampshire College created the college's sculpture program. This fall, he was also selected by the curators of this highly competitive New England Biennial at the Brattleboro Museum in Vermont. 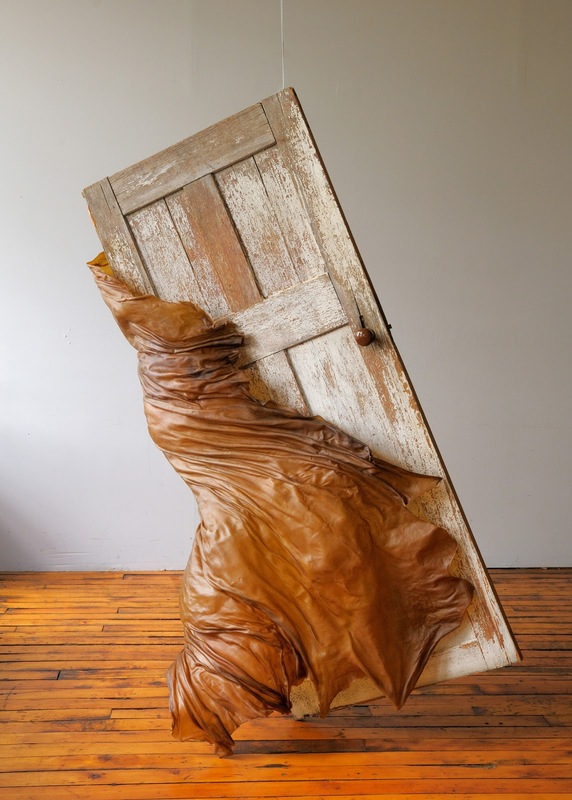 The Brattleboro's Biennial selected only seven artists from our region including New York and Brayton represents Massachusetts in this prestigious exhibit. Seems that these Biennials have similar tastes for talent in the region. 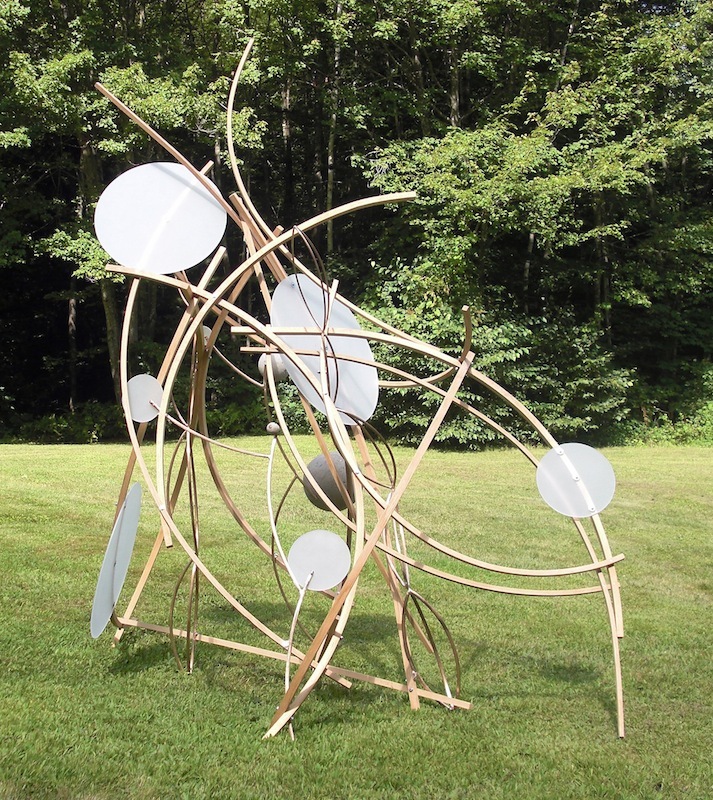 William's sculpture Encounter 2 will move next spring to the rotary at Atkins Corner bringing art to our newly constructed gateway to south Amherst near Hampshire College's campus. 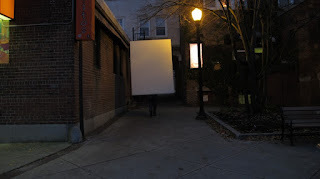 Samuel Rowlet "canvassed" Amherst, Thursday evening with his performance Landscape Painting in the Expanded Field from UMASS to The Eric Carle Museum of Picture Book Art. 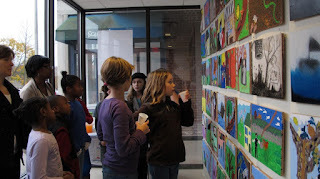 It was a fun experience to see the community reactions to his piece and how his work fit into the "landscape" of town. It was so grand to see the young artists from Fort River School, their parents and community enjoy the reception for Emily's Rhapsody at the Bank of America ATM display space. Teri Magner, Fort River art teacher organized her 4th grade students response to Emily Dickinson poems this Spring. These one foot square panels were donated by the White House Project artist, Peter Kraznekewicz to our community from the Little White House Project (5 houses are installed at the entrance of Hampshire College.) Local artists artwork from this series are installed at Emily Dickinson Museum & Amherst Town Hall Gallery.